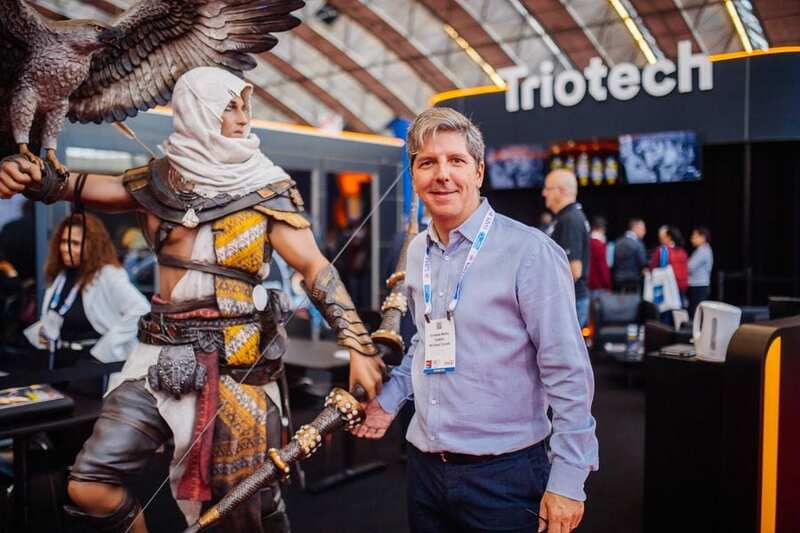 Even with visitors dispersed across six halls of exhibits, EAS 2018, the Euro Attractions Show in Amsterdam felt busy. And the numbers proved it. 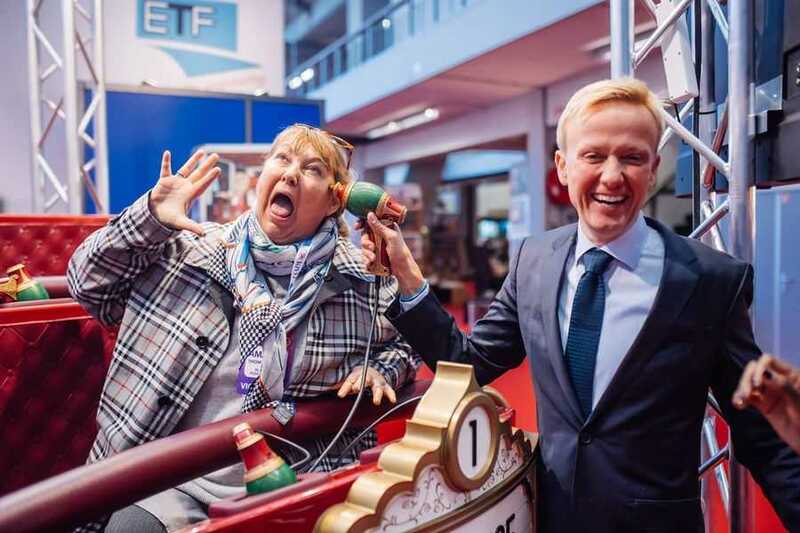 On its third visit to the Dutch capital, IAAPA EMEA’s flagship event pulled in a record 15,800 participants. That’s roughly one person per square metre of floor space (15,000 sq m). 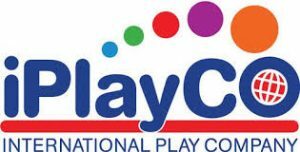 Of those, 11,300 were identified by IAAPA as buyers. Fortunately they didn’t all come at once. 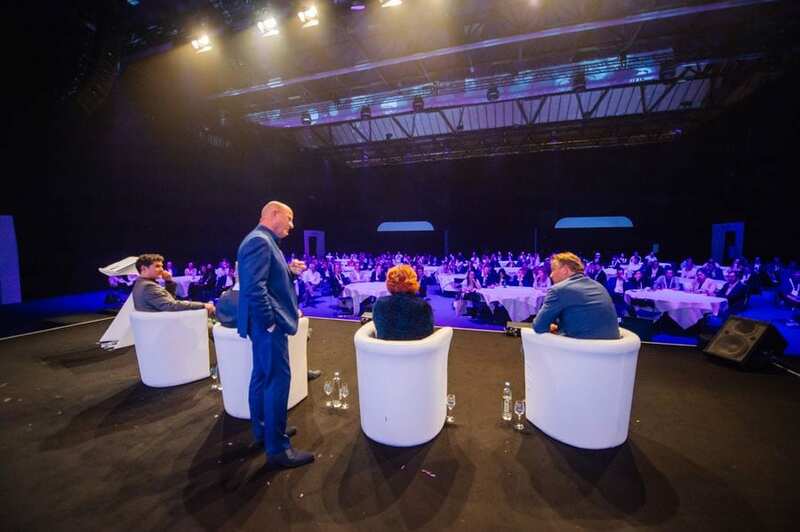 The three day event took place at the RAI Amsterdam convention centre from Tuesday to Thursday, September 25 to 27. But there was lot’s more going on, both on and off site, before and after the show. 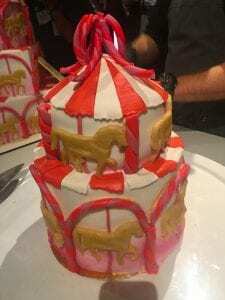 All this and a birthday cake big enough to feed over 1,000! 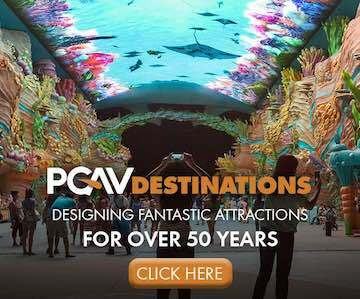 The show also highlightd the significant contribution made by attractions and suppliers in the Netherlands and surrounding countries. Almost a third of participants (5,100) came from Benelux region. Featured among the 570 exhibitors were 72 companies from the Netherlands. 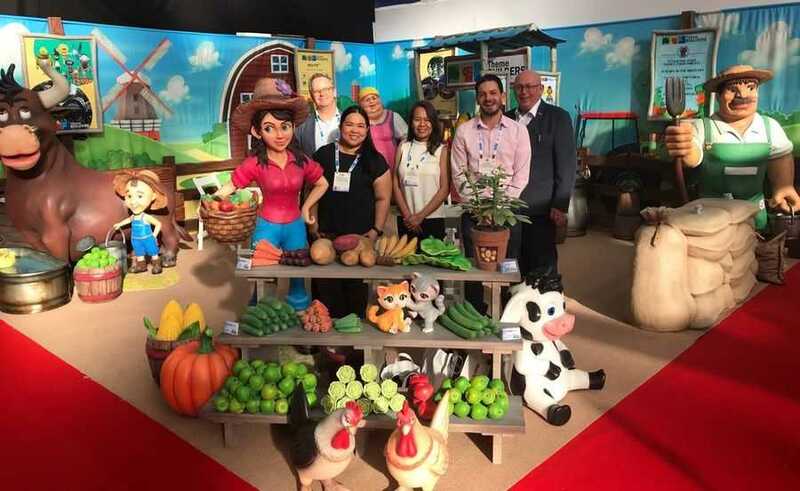 In the various education sessions, there were representatives not just of facilities such as theme parks and museums, but also ambitious projects like Holland World and the Floriade 2022 horticultural expo. More on these later. On Tuesday morning, Dutch State Secretary for Economy and Sustainability, Mona Keijzer addressed attendees during the event’s Opening Ceremony. As has become an IAAPA tradition, this included entertainment from various local theme parks and attractions. The ceremony also featured a stage dance from eight autonomous drones, provided by the French company Dronisos. As the pièce de résistance, two drones then flew back onto stage. They had a red ribbon floating between them, ready for IAAPA executives to cut and declare the show open. 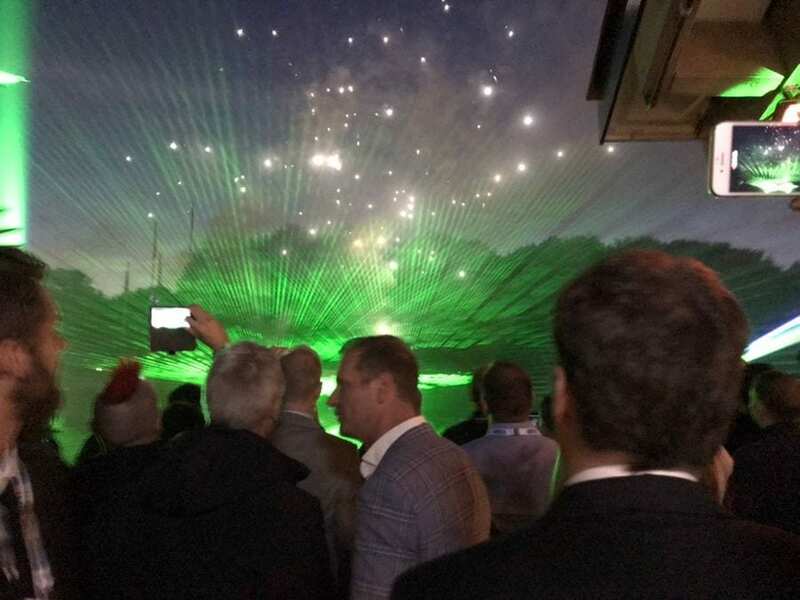 There was further entertainment, in the form of fireworks and lasers, at the Opening Reception. This always popular event was particularly well attended this year. 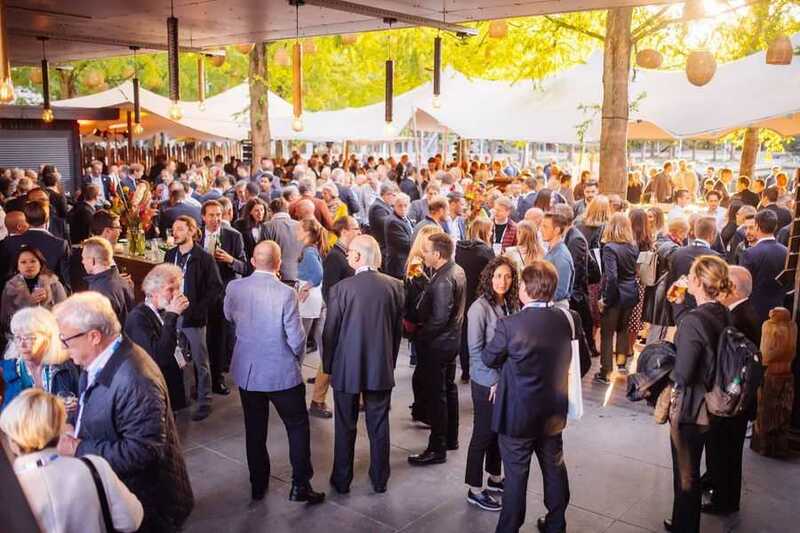 No fewer than 1,300 EAS attendees mixed and mingled at the Strand Zuid artificial beach within the grounds of the RAI. There was plenty of food and drink. The icing on the cake was the cake itself. Given that this business is all about entertaining people, it’s nice that this was reflected at such events. Of course there plenty of drinks receptions too. WhiteWater always picks unique venues for its parties. Its Wednesday night gathering at Hortus Botanicus was just as pleasant as the G&Ts. 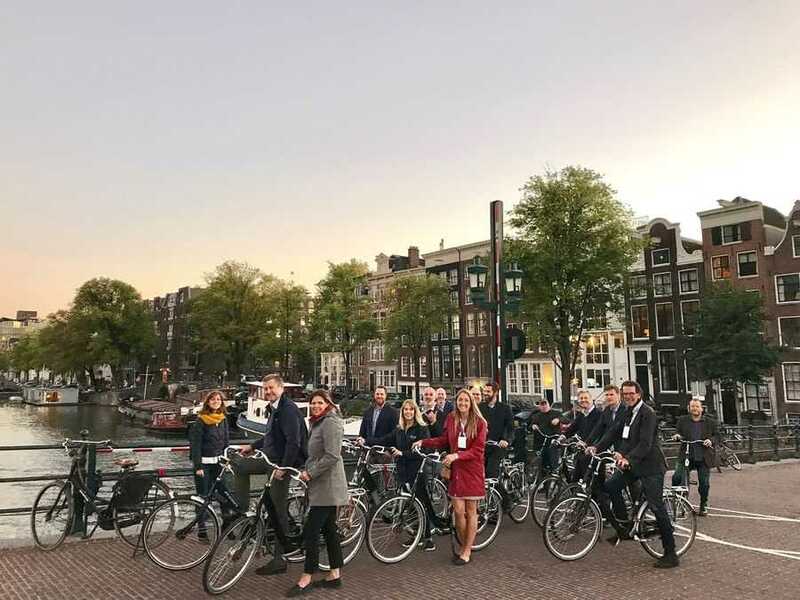 And for those who could join early enough (including Blooloop’s Charlie), the company hosted a memorable bike tour around Amsterdam. Guided by local company Ride With Me, the tour was an inspired choice by Whitewater’s marketing director Una de Boer. WhiteWater’s pre-party bike ride, EAS 2018. The Dutch capital has always embraced many forms of transport. 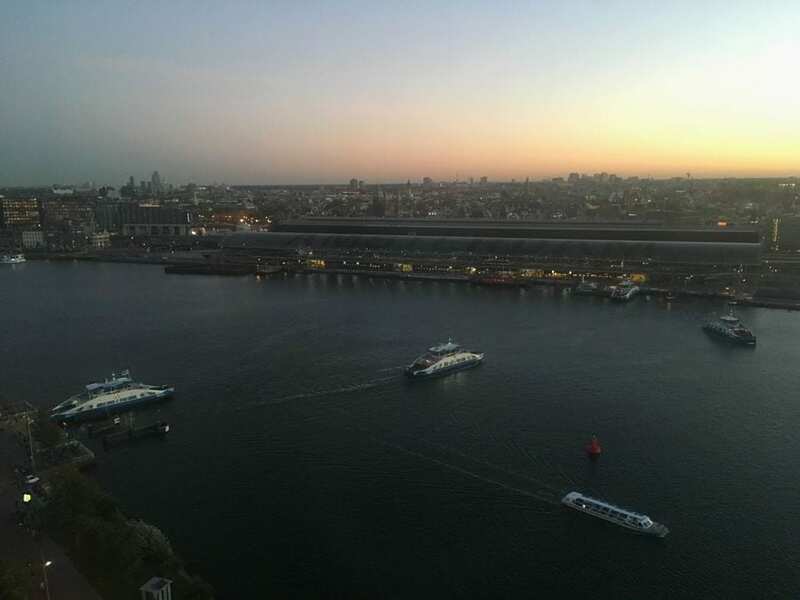 For those attending the TEA (Themed Entertainment Association) Mixer the same evening, there was the added option a ferry ride to Buiksloterweg. Here, a large percentage of the 250 or so guests got to enjoy the This Is Holland flying theatre courtesy of Brogent Technologies and Vekoma before taking the elevator to the 16th floor of the adjacent A’DAM Lookout building. As dusk fell, the views from the observation deck were superb and provided a nice backdrop to some good company. On the previous two evenings, the Brits were out in force at the BALPPA reception at Delerium Café and the Katapult party in Rembrandt Square. In honour of her service, retiring BALPPA membership supremo Jeanette Dawson was presented with a chrome-plated chain link from the Grand National at Blackpool Pleasure Beach by the park’s deputy managing director and current association chairman Nick Thompson. There were not one but two awards ceremonies held off site this year during EAS. 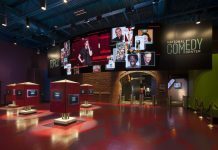 Now in their 10th year, Kirmes & Park Revue magazine presented the European Star Awards on Monday evening at The Heineken Experience. Two nights later, its British rival Park World staged its inaugural Excellence Awards event at the W Hotel. And a slick presentation it was too we hear. Whilst there was plenty of networking to be done over drinks, a more formal exchange of information was provided via the extensive EAS conference programme. Over 2,500 people participated in in-depth learning experiences, seminars, discussion forums and local attraction tours. These began on Sunday with the IAAPA Institute for Attractions Managers and culminated with a post-show tour to Toverland and Efteling on Friday. Efteling’s director and board member, Coen Bertens provided the keynote at Wednesday morning’s Leadership Breakfast. He highlighted Efteling’s development over the past 66 years, from fairytale forest to international resort entertaining over 5 million annual guests. He also touched on Efteling’s recently approved 8-hectare expansion. Yet as the park in Kaatsheuvel has grown, its rides remain the supporting attraction to two things: storytelling and nature. Even today, only 11% of its land has been developed. The Leadership Breakfast was also used as a platform to present the first ever EAS Best Exhibit Awards. 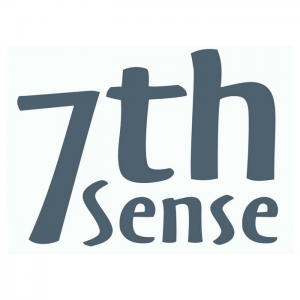 A panel of seven judges settled on winners in three categories. Particularly eye-catching was the Best Small Booth from spiral potato chip supplier Spirello BV. The display was so effective that the company ran out of free product the first day of the show. It even sold the wooden hut they were dispensed from! 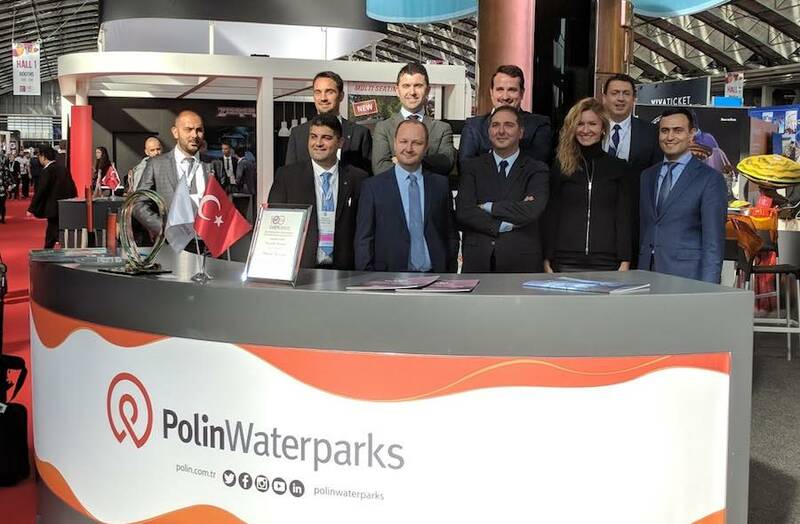 Polin Waterparks at EAS 2018. The topic of ‘Over Tourism’ is of particularly pertinence to Amsterdam. Whilst not wanting to drive tourists away completely, the city authorities are attempting to at least steer them from the well beaten path. 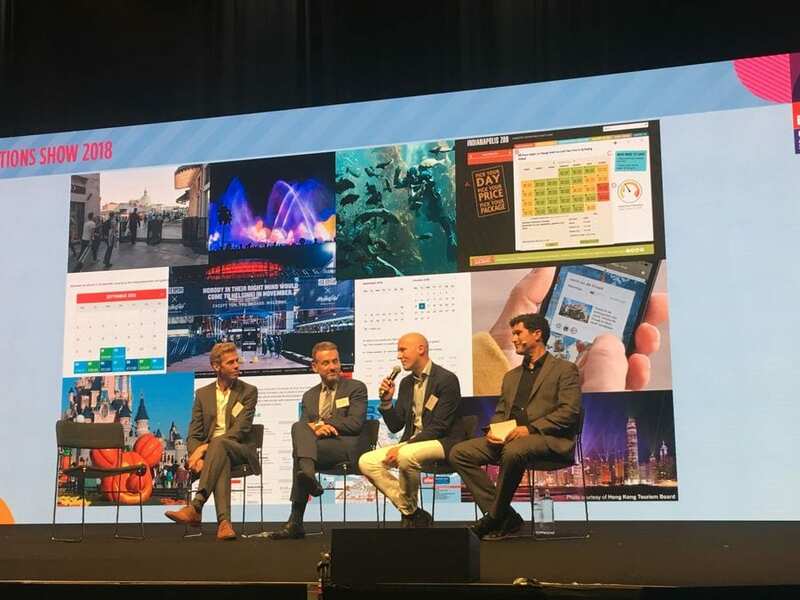 Hosting a panel discussion in the IAAPA Theatre during EAS 2018 were consultant Carolien Nederlof from Imagine Leisure and Marcel Westerdiep, representing the museum Escher in Het Paleis. Offered as a talking point by Nederlof was the proposition, “The Brand Amsterdam is the biggest competitor to the brand of Holland”. As the Dutch capital struggles under the weight of all those tourists, attractions in surrounding areas have begun attaching its name to theirs in an attempt to soak up some of the excess demand. Witness, for example, ‘Amsterdam Beach’ in Zaanvoort or ‘Amsterdam Castle’, which for hundreds of years has existed happily as Muiderslot. Even the Floriade 2022 horticultural expo in Almere is marketing its destination as Amsterdam – Almere. 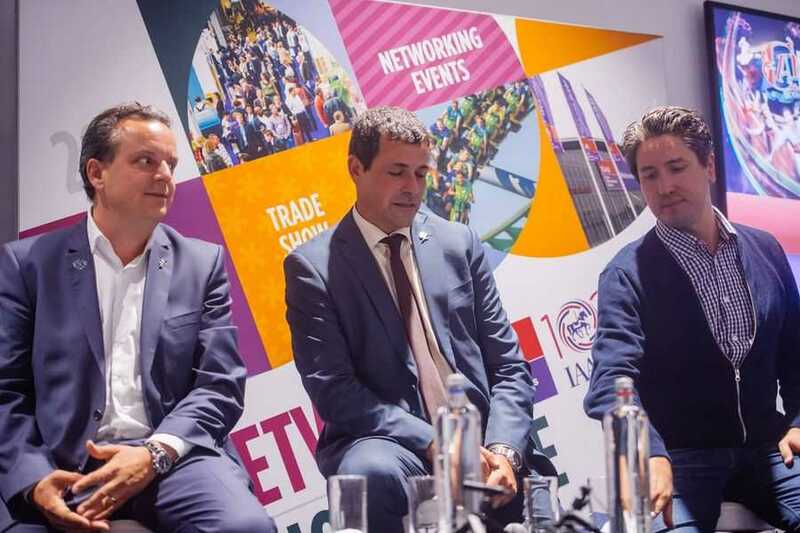 Such rebranding, and the development of new mega projects such as Holland World, risk making Amsterdam even more attractive rather than stemming the flow of visitors, suggested Stephen Hodes of the LAgroup. Meanwhile we were informed that the largest visitor group to the capital is actually Dutch people themselves. 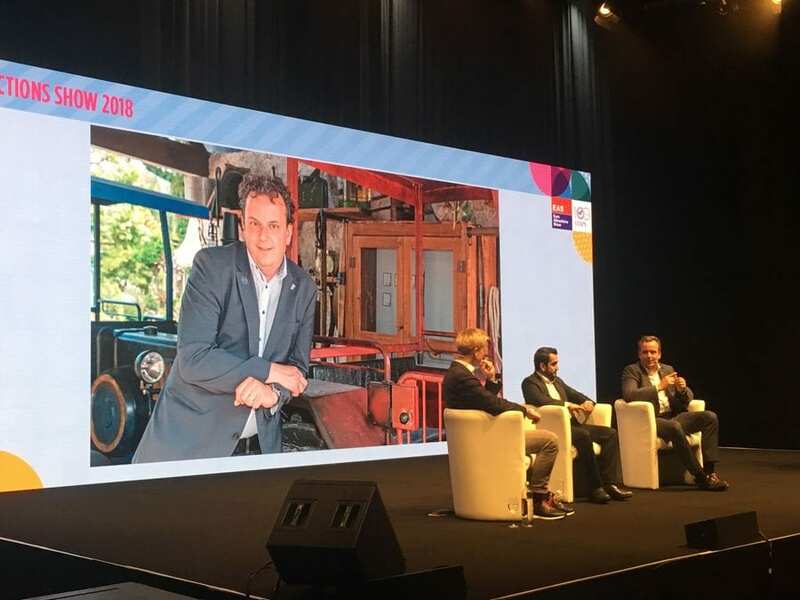 Some of the same themes were picked up by the all Dutch panel in the first of two CEO Talk sessions later in the day, moderated by Reinoud van Assendelft de Conigh (Van Assendelft & Partners). 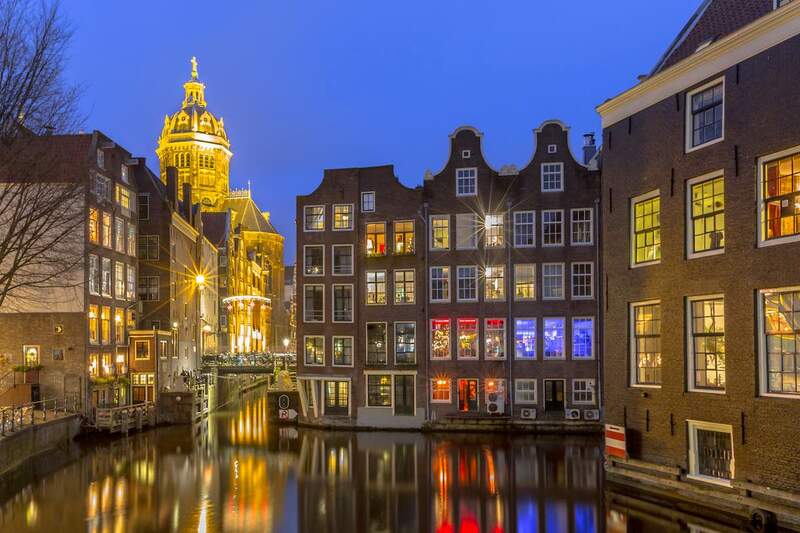 “Amsterdam is beautiful, but Holland is even more beautiful,” said Dirk Lubbers. The former Heineken Experience managing director is now CEO of Tourism Group International. “It’s hard to tell people what to do though,” he added. During a second CEO Talk panel on Wednesday, there were some interesting observations from Europa-Park’s Michael Mack. “If you want to get rich quick, don’t build a theme park,” he said. The addition of DXB Entertainments (Dubai Parks and Resorts) CEO Ahmad Hussain Bin Essa to the panel demonstrated the increasingly international reach of the industry. But where might the business go next? “In 20 years’ time we might have to think about opening the first theme park on the moon, because everybody now wants to go to space.” Bin Essa was joking of course. Or was he? There were many press conferences staged during the week at EAS 2018. These concerned new rides, attractions and product developments around Europe. Some told us things we knew already. Others elaborated on previously announced projects. A few detailed huge projects we can hope to see over the coming years. Here are a few highlights. As well as its work on the Ani-mayhem interactive dark ride at Warner. Bros World Abu Dhabi, another key project for Alterface in 2018 was Bazyliszek at Legendia in Poland. 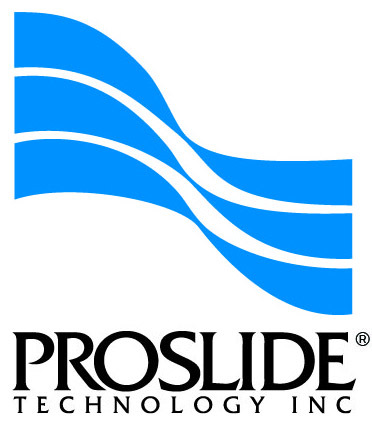 Since opening in May, the ride has picked up no fewer than four industry awards. Sitting among the audience in the room was the park’s CEO, Paweł Cebula. When EAS moves to Paris next year, Alterface hopes to host a tour to the city’s rejuvenated Jardin d’Acclimatation. This will allow visitors to experience its new Kinetorium interactive theatre. 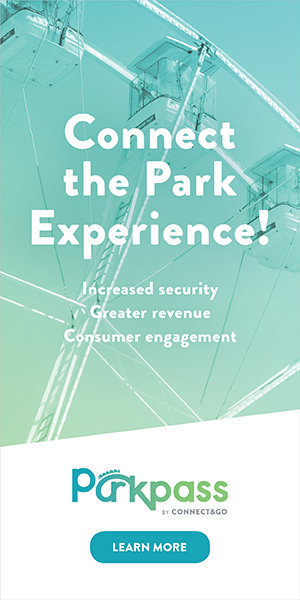 At Euro Attractions Show back in 2014, the developers of HollandWorld made a presentation about their ambitious vision for Park21 in Haarlemmermeer, close to Schiphol Airport. 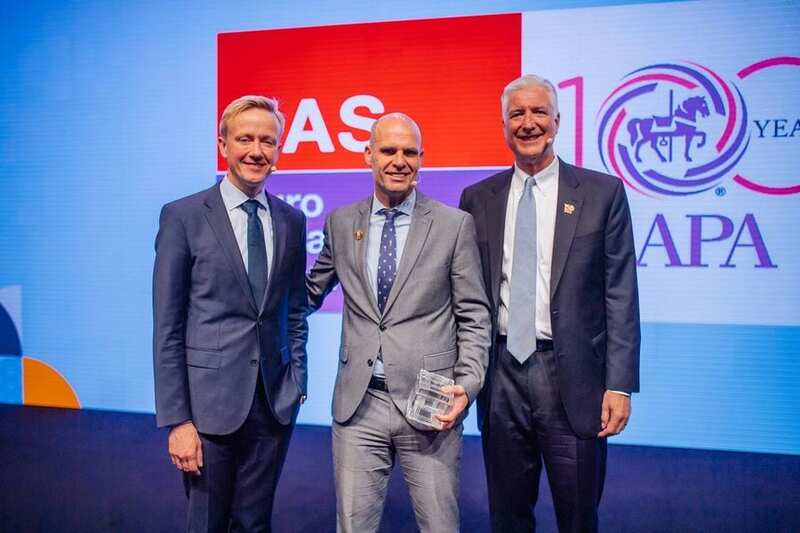 “We had the wrong idea,” managing partner Hans van Driem told those assembled for a press conference four years on at EAS 2018. 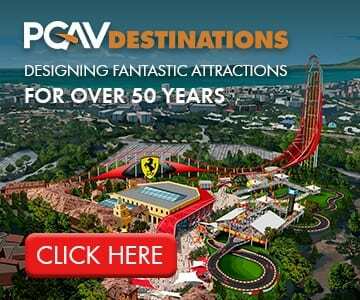 The 35-hectare non-gated park will comprise five “Dutch Destination Icon Experiences”. These will be HollandFlowerWorld, HollandHistoryWorld, HollandWinterWorld, HollandWaterWorld and HollandShow&FunCity. There will also be 4,000 hotel rooms. The idea is to give tourists to Amsterdam something to do on the second day of their visit, and take the pressure off existing facilities. Development such as these, and the proposed London Resort or Europacity outside Paris, have their sceptics. That was evident in the previous day’s panel session on ‘Over Tourism’. It all goes according to plan, the €975 million development should be fully up and running by 2023/24. More on HollandWorld, and also the Floriade 2022 horticultural expo planned for the city of Almere, will appear soon on Blooloop. We learned at EAS 2018 that Hansa-Park’s Highlander drop tower will kick off a new 10-year plan for the north German venue. The 120m-tall ride with tilting seats, supplied by Funtime, is described as the park’s “new exclamation mark”. 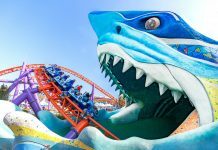 As soon as in five years’ time, said owner Andreas Leicht, much of Hansa-Park will have “a completely different look.” That will start next season with the introduction of a new themed area. This will be Beautiful Britain, in which Highlander will be the key attraction. 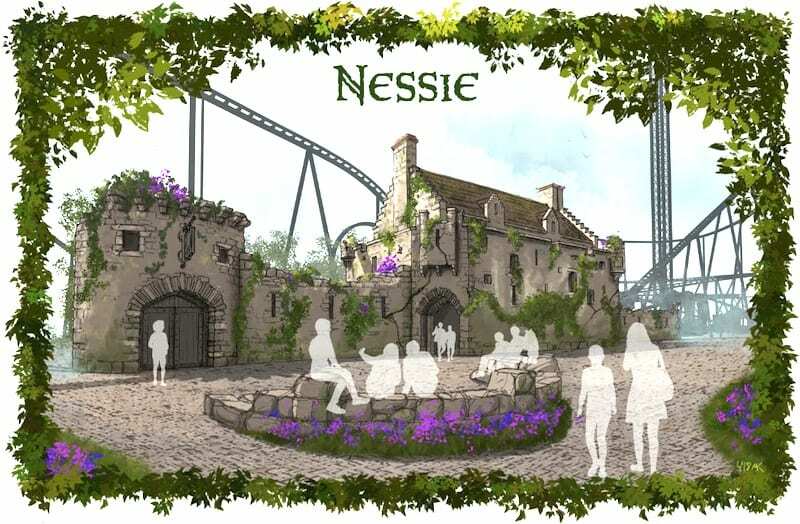 The existing Nessie roller coaster will also be integrated into this part of the park. It will be given a fresh themed station – as pictured below. Alex Korting has created designs for the new area as part of his ongoing collaboration with the Leicht family. 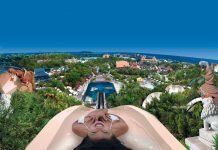 Mack Rides and Europa-Park staged an hour-long conference at EAS 2018 to detail the dramatic transformation made to one of the park’s most iconic rides. Eurosat was relaunched in September with an optional free-roaming Valerian VR experience by film director Luc Besson. Those that choose not to take experience the VR can instead enjoy the CanCan Coaster option, without the headset. Realised in partnership with the Moulin Rouge, it’s all part of the rejuvenation of the park’s French themed area. It was also revealed that Europa-Park’s Pirates in Batavia dark ride is likely to reopen in mid-2020. Featuring some added media content, it will not be a carbon copy of the attraction that burnt down earlier this year. However, fans of the original will be reassured to know that animatronics will still play a major part. 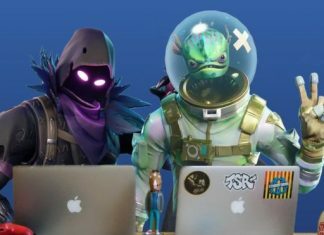 ‘Team Mack’ also teased details of new venture. 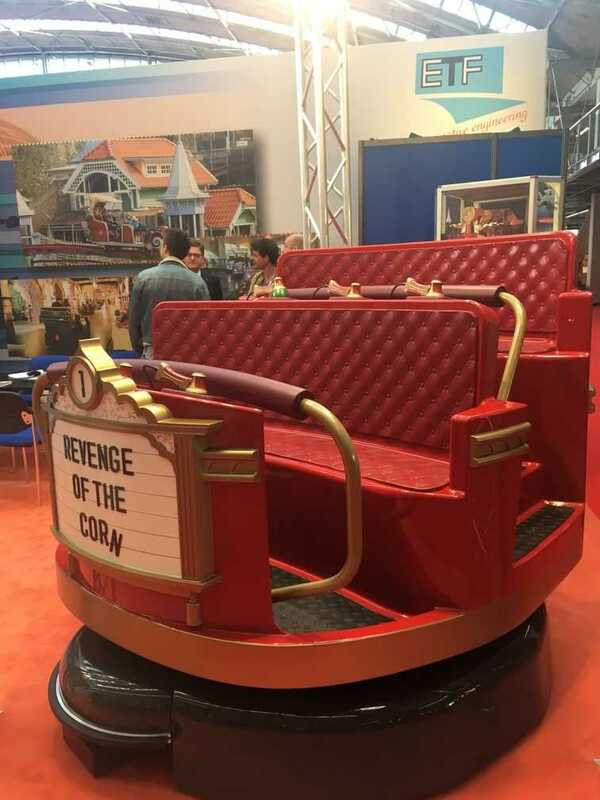 This is called Tacumeon Rides and will, together with Mack Animation, offer a “pimp my ride” refurbishment service. 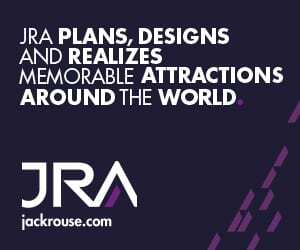 But you’ll have to wait until IAAPA Attractions Expo in Orlando this November for more details. 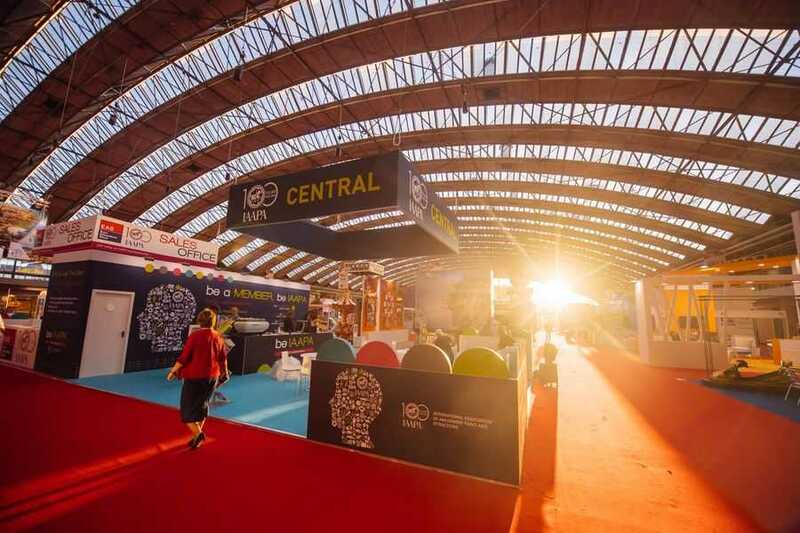 After a record-breaking performance in Amsterdam, exhibit sales for Euro Attractions Show next year in Paris are already going strong. At the time of writing, close to 400 companies had booked space. The venue will be Paris Expo Porte de Versailles, the same venue used for EAS in 2013. The dates are September 15 to 19. Allez! 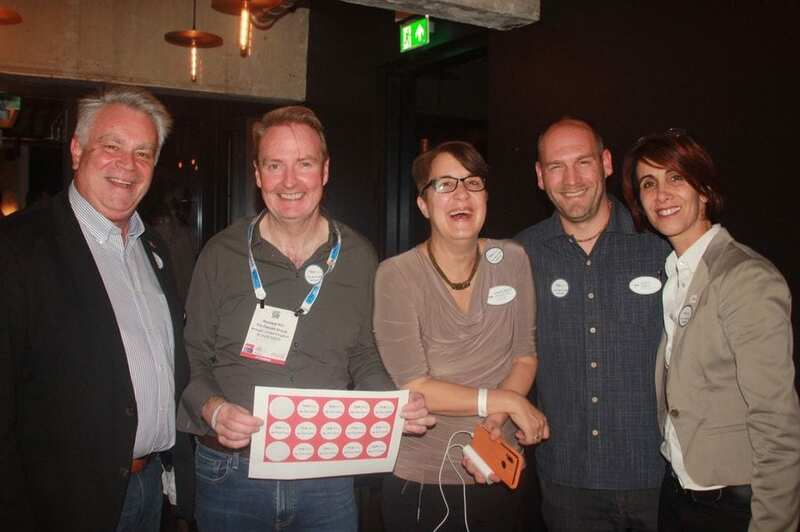 Images courtesy IAAPA EMEA, Owen Ralph, HollandWorld, Hansa-Park, Ella Baskerville, WhiteWater and Themebuilders. 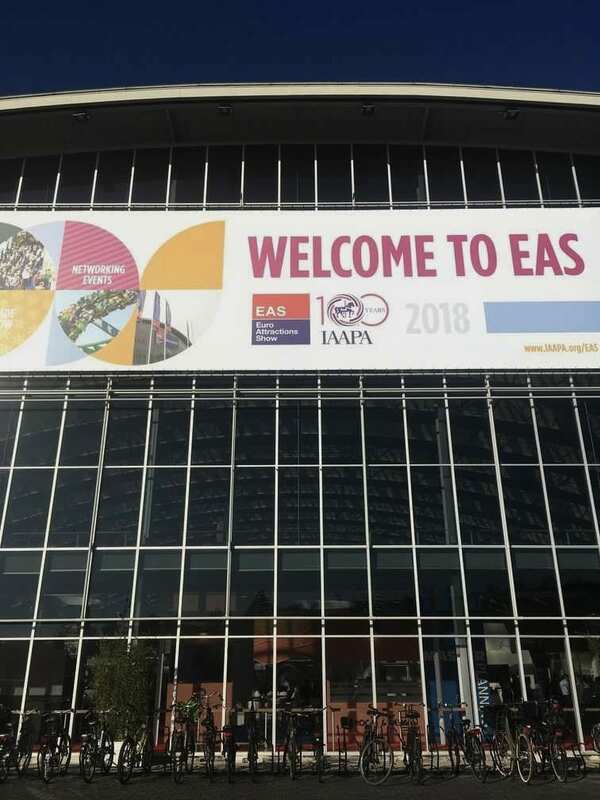 Sponsors of EAS 2018 included Leisure Development Partners, Polin Waterparks; Simtec Systems, Brogent Technologies, Gateway Ticketing Systems, Simworx, Vekoma Rides Manufacturing, Interlink, iPlayCO, JRA, Mack Rides, ProSlide, Vortex Aquatic Structures and WhiteWater. Great article. Thank you for your kind words. I feel very grateful for so much updated information about amusement industry around world.